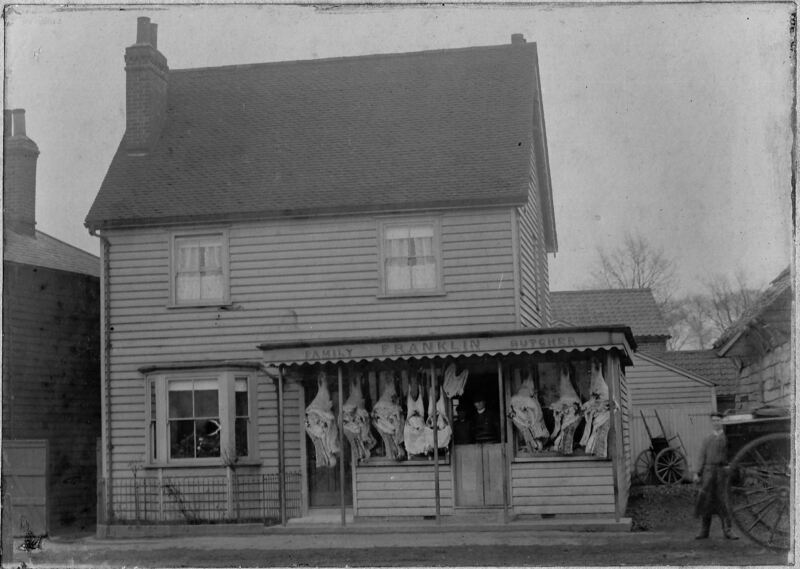 This is Franklin’s the butchers. Animals brought to the shop for slaughter were kept in the field behind the shop. Franklin’s Way is a turning off Southend Road and was named for the family. 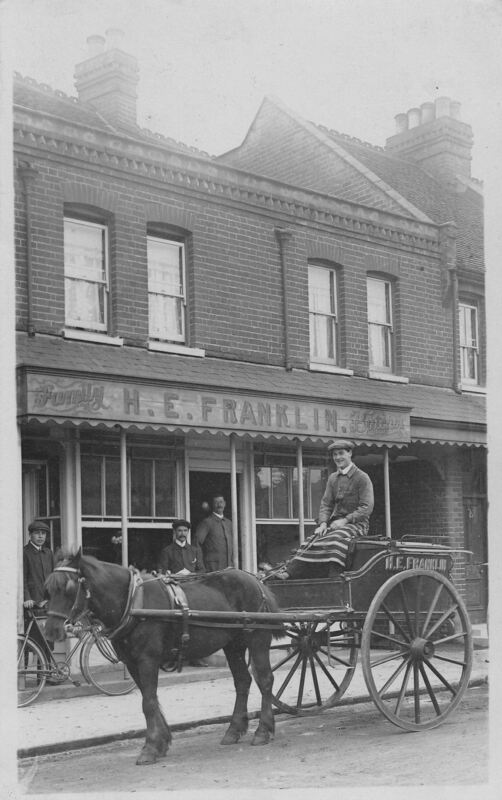 When the shop was demolished and new brick houses and shops were built, Franklin’s shop reopened on the same site. Albert Warren is mentioned in an earlier comment. I wonder if he’s my relative? My grandad was Albert Warren, his wife’s name was Flo, they lived in a bungalow named ‘Orama’. My dad’s name was Leonard and his brother’s name was also Albert. My grandad Albert had a garage in Swan Lane at some time. If anyone has any info I’d love to hear from you. In the early 70s I used to regularly shop at Franklin’s, buying half a lamb that would be jointed and packed ready for collection. They also stocked the tastiest kippers around. I worked for Mr.G. Franklin as a Saturday delivery boy (1956), then for Mr.Tom Rudd who bought the shop. When I left school in 1961 I worked full-time for Mr.Rudd as shopman/cutter. The animals were slaughtered behind The Swan pub by Mr Viggen. People who also worked here were Henry Eagle, Colin Heal, Albert Warren, Mr A.Franklin. H. E Franklin was my great grandfather. His youngest son, Leonard, emigrated to New Zealand in 1912 and opened a butchery in Christchurch.